For the photoluminescent that’s ready to go to work straight from the roll, choose Glo-Brite® ready-printed tapes. Safety: Egress delineation and hazard markings in building, marine, rail and military environments. Why Jessup Glo-Brite® printed photoluminescent tape? 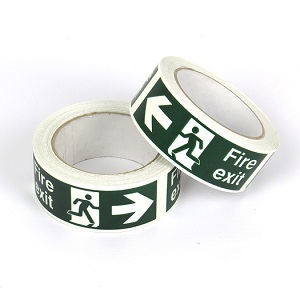 Ready to use: No printing required – so your safety markings can be in place faster. Brighter in blackout: The latest generation of Jessup Glo-Brite® safety tapes and films use photoluminescent pigments that produce a brighter afterglow in blackout conditions and charge faster in the light. Performance: Even in harsh exterior environments, printed surfaces retain their legibility and integrity. 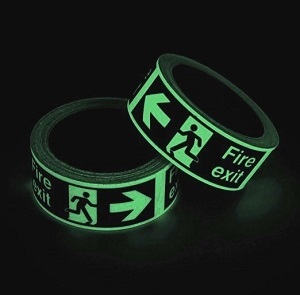 Glo-Brite® printed photoluminescent tapes exceed the performance requirements of PSPA Class B (7535) and C (7555). For technical specifications of tapes please see either Glo-Brite® 7535 or Glo-Brite® 7555.